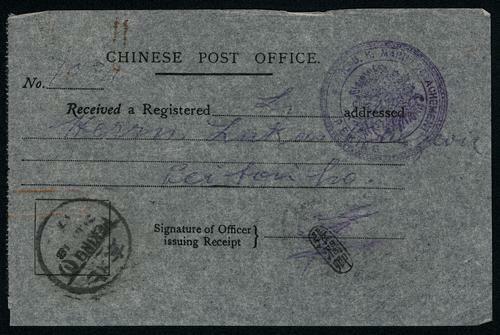 1918 WWI Chinese Post Office Registered Receipt, bearing a Peking bsected cds., along with double-ring " K.U.K. 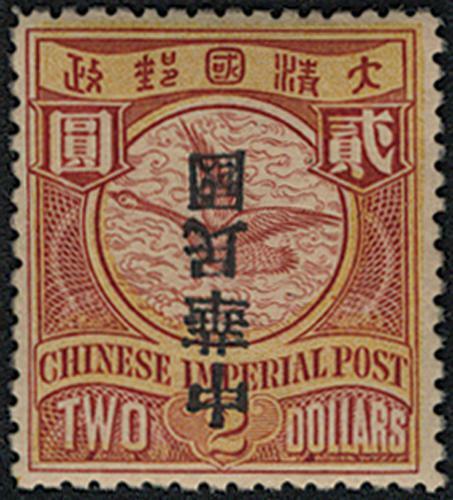 Marinedctachement / Peking" postmark. 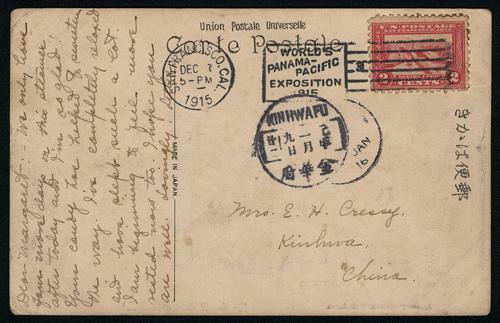 A special postal history item of Sino-Austro relations during WWI. 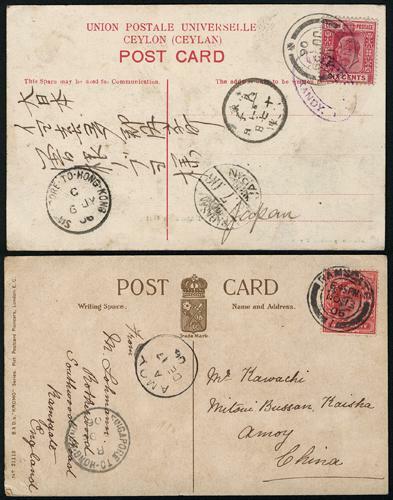 1906 GB to Amoy and Ceylon to Japan postcards, both bearing SINGAPORE TO HONG KONG Marine Sorter, index B & Index C. VF-F.
1915 (Dec 7) Yokohama Station picture postcard from USA to Kimhwafu, Chekiang, bearing a scarce Kimhwafu (Hunghsien) 1st Year arrival. 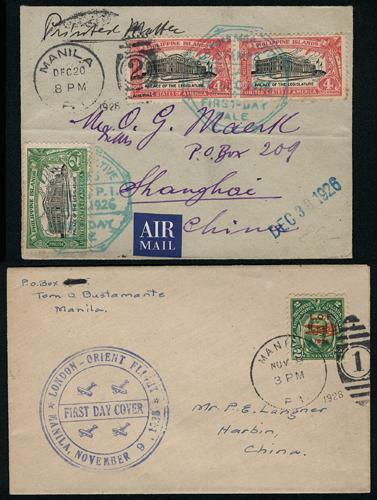 VF-F.
1920s 2 Philippines to China FF airmail covers, both tied by commemorative FF cancels. One cover with killer cancel and another one with Shanghai arrival. 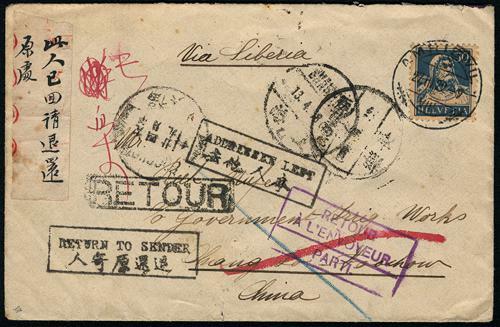 VF-F.
1929 Switzerland to Foochow incoming cover, returned to sender due to addressee left. Bearing on front Shanghai, Changle and Foochow cds., and 4 Returned to Sender cachets. 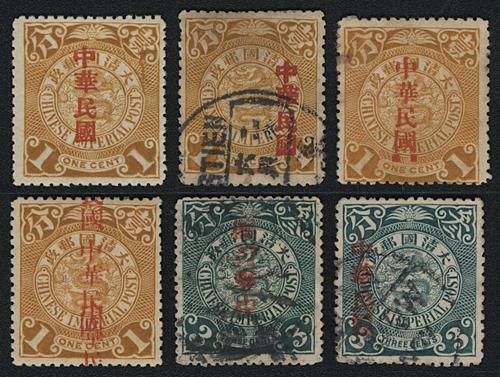 On reverse showing Foochow, Hong Kong cds. and Hong Kong Dead Letter Office cds. Interesting. 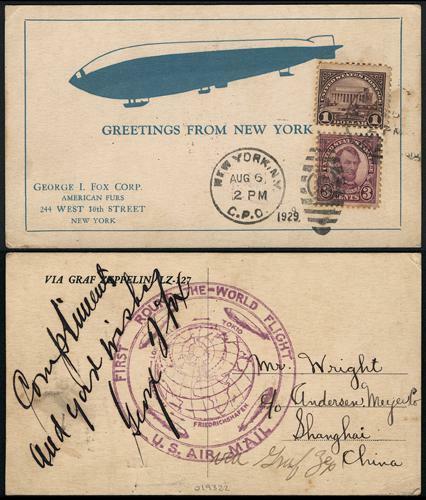 VF-F.
1929 (Aug 6) USA to Shanghai postcard by Zeppelin Airship, franked with US issue of $1 and 3c, tied by killer cancel and New York cds. Address side with "First Round-The-World Flight / U.S Mail" commemorative mark. 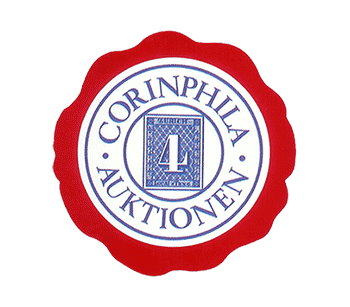 As the postage fee for Zeppelin airship was high, US$1 stamp was applied. Rare incoming postal item to China by Zeppelin Airship. 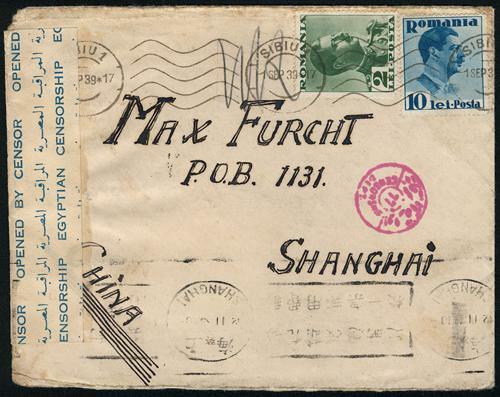 VF-F.
1939 WWII incoming censored mail from Romania to Shanghai, franked with Romanian issue 12 Lei, tied by Sibiu cds., along with censor label and Shanghai arrival. On reverse with Cairo transit. Rare censored cover from Romania. 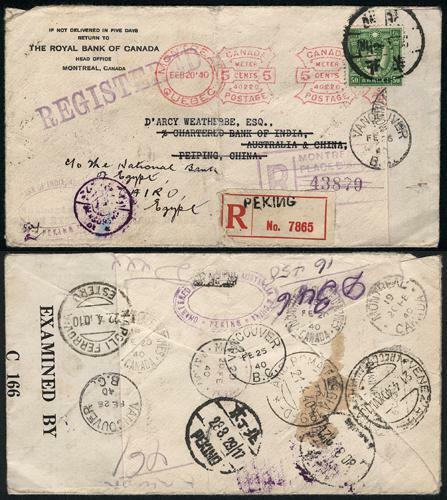 VF-F.
1940 (Feb 20) Canada to Peiping registered censored cover, then forwarded to Egypt. 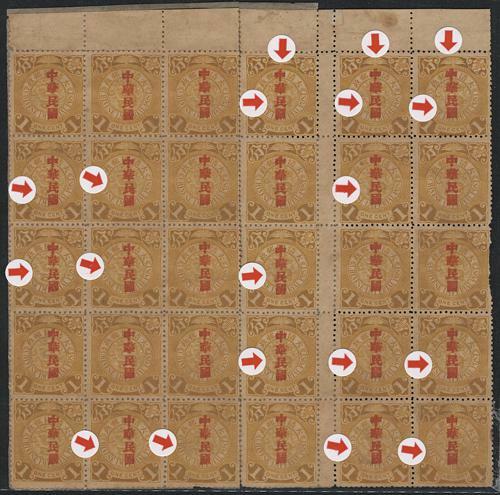 Franked additional Martyrs Issue 50c, tied by Peking cds. 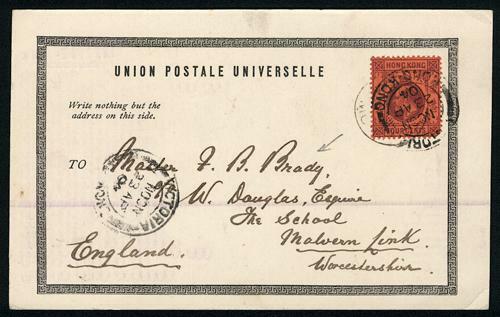 On both sides showing numerous postmarks and censored marking. 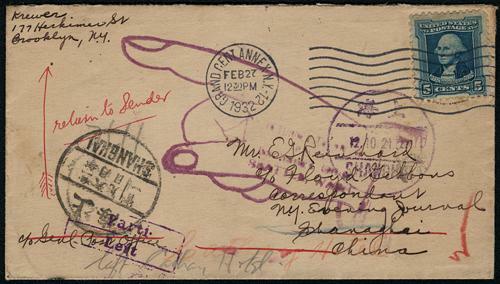 Very interesting postal history item during WWII. Folded in the middle. VF-F.
A group of 54 CIP or CIP ovpt. ROC issued, all used with Shanghai LPO cds. 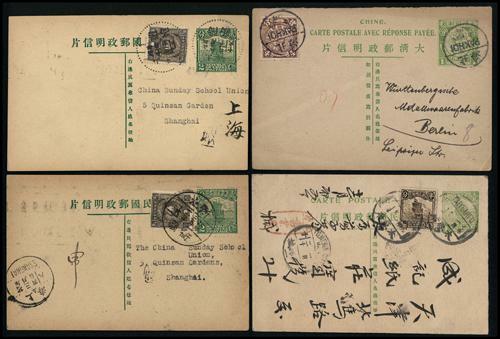 VF-F.
1900s-30s a group of 7 Imperial and ROC postal cards, all postally used. 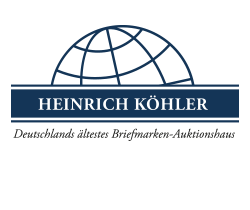 One international mail and other are domestic mails. 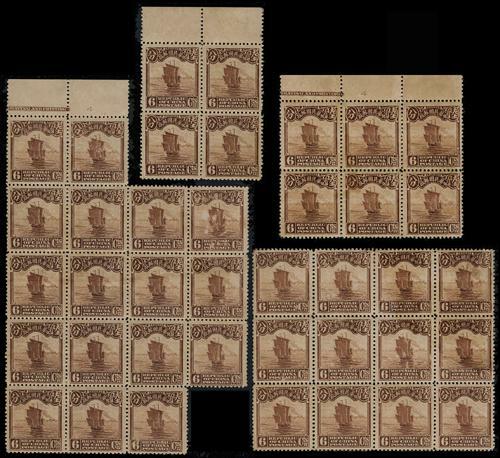 VF-F.
1912 a group of 38 Local Overprinted CIP ovpt. 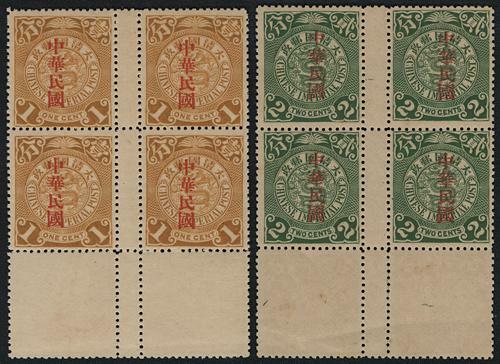 ROC issues, including Kiangsu, Fukien and Kwungtung overprints. Interesting. 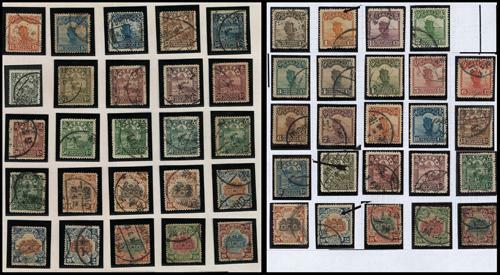 VF-F.
A group of about 171 ROC Junk issues, all mint, including a few Limited For Use in Szechuan issues. 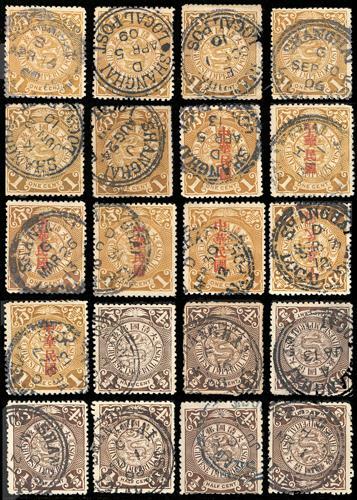 Many Brown 6c stamps, in multiples. VF-F.
1910s-40s a collection of ROC issues in an album, including Junk, SYS, Martyrs, Commemorative, Airmail issues, etc. Large quantity. Need viewing. 1912 A group of 6 CIP Statistical Dept. ovpt. 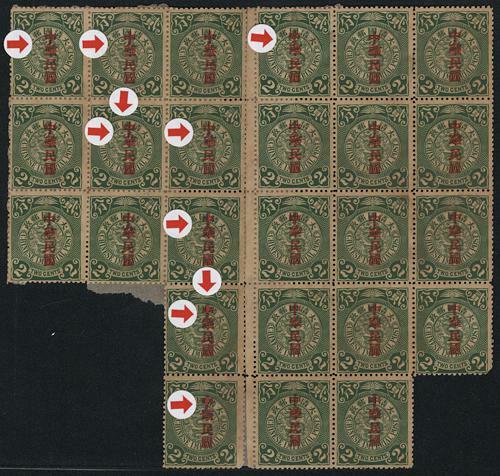 ROC stamps with varieties, three mint and three used, including overprints misplaced, inverted, doubled, etc. 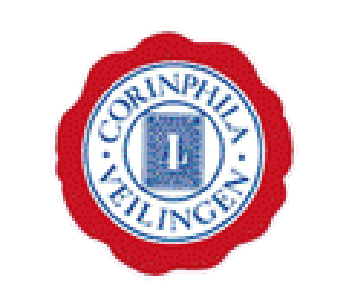 VF-F.
1912 CIP Coiling Dragon ovpt. 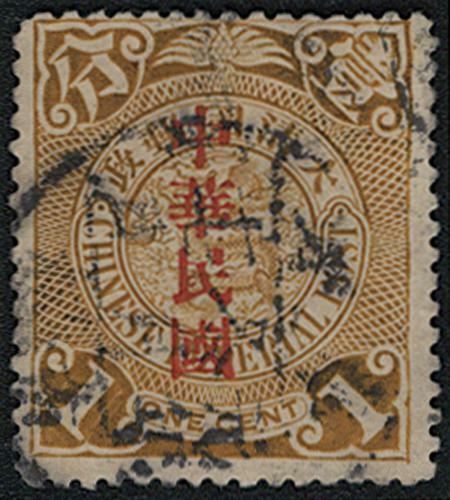 Provisional Neturality 3c marginal block of 25, with sheet number #365 at lower right (Chan145), fresh MNH with pristine original gum. Very Fine. Rare in this large multiple. 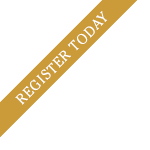 1912 CIP Commercial Press ovpt. 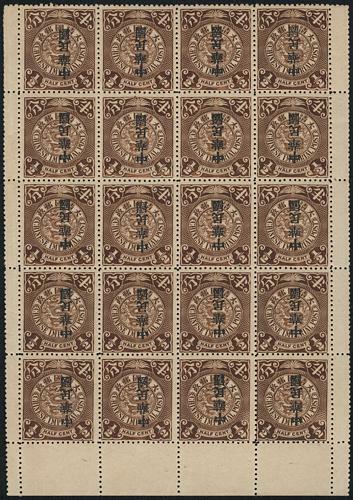 with Large "Kuo" set in gutter blocks of 4 (Chan 167-168), fresh MNH with pristine original gum. Very Fine. 1912 CIP Coiling Dragon London ovpt. ROC 1/2c block of 20, unused without gum. VF-F.
1912 CIP 2c London ovpt. ROC block of 20, mounted on a paper, some perfs separated. Slightly toned. 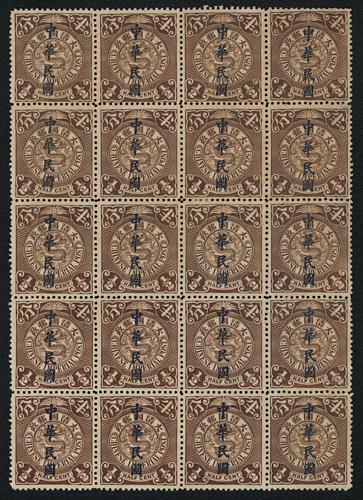 VF-F.
1912 CIP Statistical overprint ROC 1/2c pane block of 20 with inverted overprint variety (Chan 152b), fresh MNH with pristine original gum. Very Fine. Rare in such large multiple. 1912 Statistical Dept ovpt. 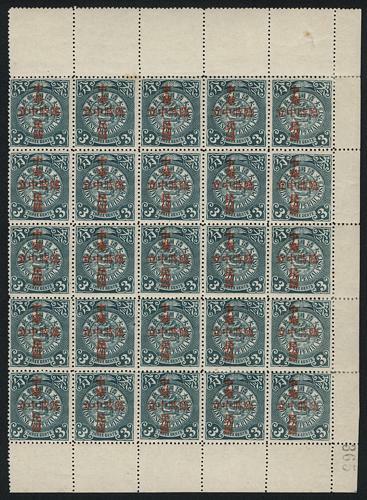 ROC on CIP 1c block of 30, right 3 column stamps with slightly double overprint varieties. Toned and with paper remnant on reverse. F-VF. 1912 Statistical Dept ovpt. 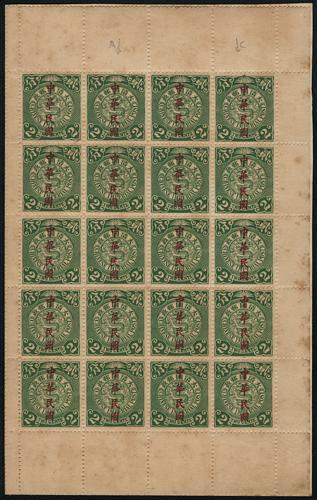 ROC on CIP 2c irregular block of 25, with several overprint varieties. Toned and with paper remnant on reverse. F-VF. 1912 CIP Coiling Dragon 1c Commercial Press ovpt. ROC, with broken top of "ONE" variety (Chan 167b), fine used. VF-F.
1912 CIP Coiling Dragon Statistical Dept. ovpt. ROC $2, with inverted overprint variety (Chan 165b), fresh MNH with pristine original gum. Very Fine.